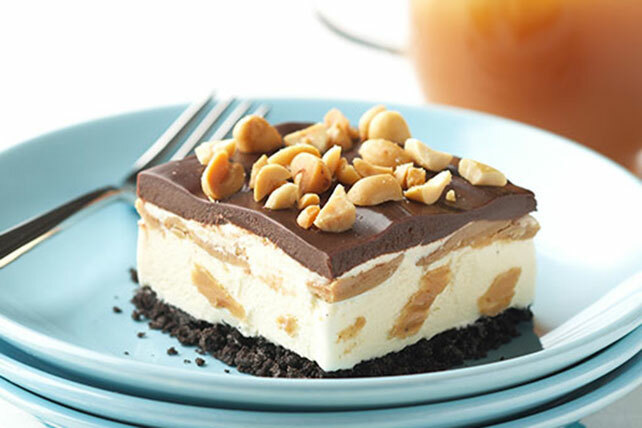 Here's a delicious frozen dessert made with vanilla ice cream, creamy peanut butter, chunks of chocolate and a finely crushed cookie crust. Combine cookie crumbs and butter; press onto bottom of 13x9-inch pan. Freeze until ready to use. Microwave peanut butter in small microwaveable bowl on HIGH 1 min. ; stir. Swirl peanut butter into ice cream; spread over crust. Freeze 30 min. Microwave COOL WHIP and chocolate in medium microwaveable bowl on HIGH 1-1/2 to 2 min. or until chocolate is completely melted and mixture is well blended, stirring after each minute. Spread COOL WHIP mixture over ice cream layer; top with nuts. Freeze 4 hours. Remove from freezer 10 min. before serving; let stand at room temperature to soften slightly before cutting to serve. You'll know it's a special occasion when you get to enjoy a serving of this delicious dessert. Substitute caramel ice cream topping for the peanut butter. Do not microwave before swirling with the ice cream.